I couldn't get his ears in! 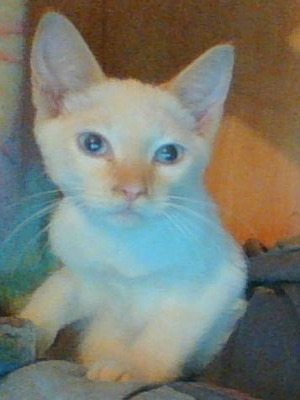 Marshmellow looks like a flame point Siamese, but his mother is a stray short-haired red American cat; we are not sure about his dad. When his mother Spooky (who we had been feeding and taking care of) was pregnant we did not notice until about five weeks in and she was getting big. I asked her "have a white kitty cat, okay Spooky?" I was thinking she was not going to. When she was about nine weeks in we started getting worried; we didn't see her at all for a few days but after several hours she came out of our friend's garage - skinny! We went over and asked to check and sure enough the kittens were in there. She had six in total, one white one and I said "this one's mine". After a few weeks we brought the mother and kittens in under our porch with food, water, a litter box,and a cage for them. I started bringing Marshmellow into my room and holding him a lot for about an hour or two. 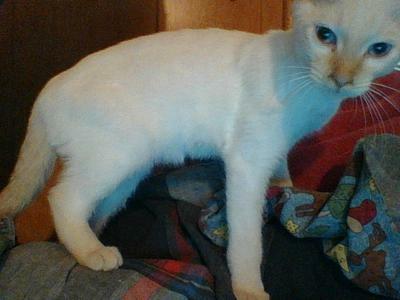 He was getting some orange on him and I thought "he looks like a Siamese", so I looked it up and found this site and sure enough he is a flame point. Once Marshmellow was eight weeks old we brought him and the others up here for good (we are planning on spaying the mother and fixing all the kittens). We gave a friend of ours one that looked like the mother and he named her Sassy. We named the two black cats Kathloo (my brother says it's a demon name lol), the one that we think is a chocolate point Siamese was named Smokey, and the last one is like a long-haired American blue - we named him Outlaw. Marshmellow comes to me whenever I call him, no matter where I am. I trained him to sit and he loves getting brushed, being held, having his nails trimmed, belly rubbed and petted but he only lets me do all of them. As you can see in the pictures he is just starting to get stripes on his face. Marshmellow has a few nicknames (Marshy, Marsh, and rarely, Sand Angel.) I will always love Marshmellow; he has a permanent spot in my heart. Note from Caroline: Shadow submitted a second story about another cat of hers, Patches. We combined the two stories as they seem to go together well. Here's Patches' story. Patches is not Siamese or any kind of special breed. I'm not saying I don't like Siamese - heck I love them! 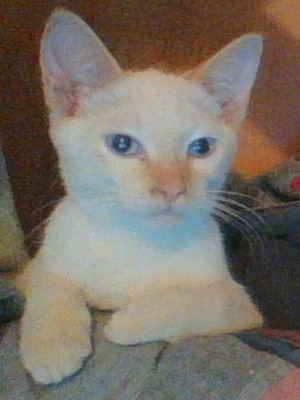 I have a flame point I love dearly whose story you've read above. But back to Patches ... Patches is special to me and although part of his story is sad most of it is good. The first second I saw Patches come out of his mom (my cat Munchkin is his mother) I claimed him as mine because first of all he was smaller than all the others and had a broken tail at the tip, and he is cute. I picked him mostly to make him feel wanted. As he grew older I grew closer to him. It was hard to figure out his gender; we kept going back and forth and finally after about six months we knew he was a boy. Patches doesn't like to play a lot but I'm fine with that. But he does love to rub against you when you sleep, and he also loves to sleep with you. Sadly Patches is battling with anaemia but he is winning so that's good. We have to fight to give him his medicine and usually end up with blood drawn but as long as he gets his medicine that's OK. This battle has been bringing us closer. Sadly I have no pictures of him but he is all white with gray patches all over him. The biggest patch is on his back and wraps around to his stomach. The patches on him have leopard-like prints in a darker gray in them. Thank you so much for your stories about Marshmellow and Patches, Shadow! It always surprises me how many stray cats develop Marshmellow's coloring (I've included some links to a few similar stories below). I hope you managed to find good homes for the other kittens and the momma cat too - although perhaps, being a stray, she may feel more comfortable outside. Your story brings up the very good point that it's so important for kittens to be handled and socialized while they're still young, and it sounds as if you did a very good job with Marshmellow. I hope he has a long and happy life with you! I loved your story about Patches too. I hope the medicine you're giving him continues to help him; he sounds really cute too! Hey it's me, Shadow. Sadly about a year ago Patches passed - he will forever hold a spot in my heart. Marshmallow on the other hand is a healthy two-year old cat now. I think his markings are as dark as they are going to get. Thanks for submitting my story.